Some of my earliest memories are of my dad reading to me each night as I fell asleep. An avid reader himself, he insisted on reading me the classic (and unedited) fairytales of Aesop, Hans Christian Andersen, and of course, the Brothers Grimm. This could definitely explain my continued fascination with all things fantastical and mysterious. Fast-forward a couple decades to NBC’s announcement in 2011 that they would be premiering a show called Grimm, in which the creatures from the Grimms’ fairytales (referred to as Wesen in the show) are very real, and a familial line of Grimms serve to protect the rest of the world from these beings who live among regular humans in secret. I was hooked before I’d even seen the show, and I’ve been pleased over the years to see how Grimm (now in its fifth season) has grown from its weird and slightly campy beginnings to a solid show that has successfully built a complex world deeply steeped in the fairytale lore I love. Marie Kessler (Kate Burton) is the aunt who raised main character Nick Burkhardt after his parents supposedly died in a car crash when he was a child. Aunt Marie shows up in the pilot, grimly bringing the news (pun intended) that Nick is a Grimm. Aunt Marie exudes a quiet and resigned strength. It’s clear that she finds no pleasure in being a Grimm — she refers to it as the curse of their family — but she accepted her fate long ago and does what she must to protect the world from evil Wesen. When Aunt Marie appears on Nick’s doorstep, she is dying of cancer, and it is her imminent death that triggered, in Nick, the until-then dormant Grimm abilities. Though the character of Marie appears in only three episodes, her wisdom and knowledge are intertwined throughout every episode thereafter. After her death, Nick inherits a small trailer she’d been towing behind her SUV, and it is in this trailer that Nick begins to understand his role. Marie’s whole life is in the trailer — ancient books with loads of information about Wesen and some pretty crazy weaponry and potions. She has left Nick with a physical trailer, but in so doing, she’s left him with something more — she’s given him a legacy. She spent her life fulfilling her portion of that legacy, and she did it all alone. She chose to give up everything and everyone she cared about to protect them. Her choice took strength and it is clear in her conversations with Nick that her lonely existence and the dangerous life she led were sacrifices she knew she must make because her life was not her own and her choices affected the entire world. Nick owes everything he is as both a man and a Grimm to this resilient woman, and the show makes sure we, as the audience, don’t forget that. Kelly Burkhardt first shows up at the end of season one. She is Nick’s mother whom he had thought died long ago. She too is a Grimm, just like her now-deceased sister Marie. Unlike Marie, however, Kelly seems to fully embrace her role as a Grimm. She is an experienced killer and appears to even take pleasure in killing Wesen. It is clear that she views the world in black and white: Grimm are good and Wesen are bad. She is surprised and disapproving when she finds out Nick is friends with two good Wesen, Rosalee and Monroe, and her distrust of them is evident. Her indomitable strength is quite literal in the show, but as the series progresses, we discover other aspects of strength in her character as well. She begins to soften her views toward Rosalee and Monroe, though it’s clear she still views them as the exception to the rule. When tasked with protecting Adalind and Adalind’s newborn baby, Diana, we see glimpses of something else — something quieter — beneath the battle-hardened Grimm. She is clearly not very at ease in the role of caretaker and mother, and actress Mary Elizabeth Mastrantoni reveals this conflict with subtle grace. When it becomes clear that the only way to protect baby Diana is for Kelly to take her on the run, she does so, and with this choice she embraces quieter strength, setting aside her role of Grimm for the time being. Kelly is a complex character with many faults, and it is in these faults that we see both her strengths and her weaknesses. She is physically strong and fiercely loyal, but she is also narrow-minded in her views. After her husband and friend were killed long ago, she made the decision to leave her young son with Marie, instead of staying and protecting him. Later, as she and Nick begin to rebuild a tentative relationship as adults, she admits that she feels her choice was a mistake. This took incredible strength for someone like Kelly to admit she was wrong. It’s clear she views her decision to take Diana as a chance for redemption. We see Kelly just once more — in season four where she meets her death. She thinks Nick is in danger, and it’s that loyalty and love toward her son that bring her into battle this final time. It seems a fitting end for this character: dying to protect the son she once abandoned. I’m not going to even try to deny it — Rosalee is my very favorite character on the whole show. We first meet Rosalee, played by the brilliant Bree Turner, toward the end of season one when she gets a call from Nick that her brother has been murdered. Both Rosalee and her brother, and their parents before them, are apothecaries. They are also Wesen. Rosalee has a sordid past which we hear a little about when she’s introduced — she was addicted to drugs and even spent some time in jail. But the Rosalee we meet is wise, kind, and quiet. Her past is behind her and she has learned and grown from her mistakes. When she arrives in Portland, it is with the sole intention of claiming her brother’s body and packing up his spice shop to get it ready for sale. In the end, she decides to stay and re-open the shop, and has been an integral character ever since. Rosalee possesses a keen knowledge of the various effects herbs and spices have, specifically on Wesen like herself. Being a skilled apothecary, she is an invaluable asset to Nick’s team as she whips up potions and healing salves and basically keeps the team alive through each episode. She and Monroe also have one of the most beautiful relationships on television. Their romance develops incredibly slowly — which I appreciate — and has its foundation in their mutual respect for each other. It’s clear Monroe respects her and looks to her for advice and knowledge. There’s never any question that he views her as an equal, and he readily takes on the role of assistant in the spice shop, helping her concoct mixtures and eagerly learning from her. Rosalee is one of the only women on Grimm who is not a skilled fighter or portrayed as physically strong. Her strength is never questioned — but it is an entirely different type of strength. She is introverted and introspective, clearly at home being alone in the spice shop, reading potion books, restocking herbs and spices, or creating some healing solution for whomever is injured this time. Her knowledge and skills are vast, and Nick and his friends would all be dead five times over if it wasn’t for her help throughout the seasons. I appreciate that the creators of Grimm let Rosalee be exactly who she is and fully embrace her as a valuable asset to the group, even though the weapons she wields are spices and chemistry rather than crossbows or martial arts. We very rarely get to see Rosalee involved in a physical fight, and only then when she is forced to defend herself or someone she loves. And it’s clear in those moments that she is just as brave as everyone else, but she choose her battles and she uses her strengths and cunning to heal not to hurt. She’s truly a beautiful character inside and out, and such an important part of the Grimm storyline. Adalind is the first Wesen we (and Nick) meet in the pilot episode. She is purely one-dimensionally evil at first, but as the series has progressed, the writers have given Adalind some great complexity and depth. She marks herself as Nick’s nemesis from the very beginning when she unsuccessfully tries to kill Aunt Marie herself (and is stopped by Nick), and then successfully hires an assassin to finish the job for her. She does a number of unspeakable atrocities to Nick and those he loves. She is ruthless and cunning and whatever evil scheme she’s up to, you always know she has only her own interests at heart. She was that character you loved to hate so much that all of a sudden you started just loving her. I mean, it helps that Adalind is played by the fantastic Claire Coffee who often live-tweets during the show with little behind-the-scene tidbits or hilarious commentary. But Adalind herself is lovable too — she’s a brilliant lawyer, a vicious Wesen, and a formidable antagonist who always seems to have the upper hand. But the writers have given us little bread crumbs of something more as we’ve gone along on this journey. When Adalind gives birth to Diana, we see another side to her. She is still evil and malicious, but she also deeply loves her child and will do anything to protect her. And with that, there’s suddenly a little chink in the self-serving impression armor we had of Adalind. She now has the interests of her child and herself at the forefront of every action. Being a mother was never something she wanted or thought for herself, but she fully embraces it. And when Diana is taken from her, Adalind's rage and vengeance are real. She will do whatever is takes to get revenge and we, as viewers, understand and accept that. And then in season four, after all the havoc she’s wreaked, the creators throw us another curveball: Adalind makes the selfless decision to suppress her powers in the hopes of saving Juliette. This wasn’t an easy choice, but Adalind took responsibility for the fact that Juliette was in the predicament she was because of her, and that only she could help make it right. So we get to see Adalind actually trying to embrace the idea of being good while making amends for her past. It’s an interesting twist, and Adalind’s struggle is evident. She knew and loved who she was before, and though she wants to embrace who she is now, that’s often easier said than done. There’s a lot of temptation in going back to who she was and even more uncertainty at continuing down this new path. Adalind is having to learn that her strength didn’t come from being evil — her strength is deeper than that. But she hasn’t yet figured out how to re-direct that strength, and so season five finds her in the midst of figuring that out. Meanwhile, Adalind has a new baby to take care of now, and another out there who was taken from her and who she misses terribly, so she’s also put this double pressure on herself to make sure her second child feels all the love and gets all the protection she was unable to give her firstborn. In the midst of all the supernatural Wesen struggles, Adalind is also dealing with some very real human struggles that all new mothers go through. She doesn’t always know what to do or how to calm and care for a baby. She wonders if this is all there is to her life now. She remembers when she was a high-powered lawyer and she misses the feeling of confidence she had, easily navigating the world of law. These are relatable feelings and we empathize with Adalind's tension and internal struggle. Adaline has been put through a roller-coaster of plot twists more than any other (except maybe for Juliette), and through it all we’ve seen her multi-faceted strength play out. Right now, her character is in flux and I can’t wait to see where the writers take her next. Juliette (played by Bitsie Tulloch) is Nick’s girlfriend and arguably the main female character of the show. She’s also the hardest for me to write about because I find her the most problematic. For a main character, the writers have given her surprisingly little depth, and this bugs me. All of the other female characters are full of complexity in the form of a whole host of strengths and flaws, but Juliette is kind of just... there. We know very little about her, and this is part of the problem. She is introduced in the pilot as Nick’s girlfriend whom he’s planning to propose to, and we’re told she’s a veterinarian. Later we find out she’s fluent in Spanish and... well, that’s it. It takes the whole of season one before Nick will finally admit to her that he’s a Grimm. I mean, I get that’s not an easy thing to reveal to someone, but she’s the person you’re planning to spend the rest of your life with and this is a big part of your life, so you might wanna have a talk about it, buddy. Then in season two she promptly loses all her memories of Nick, including his big reveal to her that he’s a Grimm. The character of Juliette is kind of batted around as an easy target for bad things to happen to since she’s the person Nick cares about the most. And it seems that’s the only reason she exists. There’s not much character development or anything to grasp onto that makes her likable, relatable or even memorable. Even after the writers finally decided to let her know (for real this time!) that Nick is a Grimm and what that means, her character doesn’t change that much. After some initial resistance, she accepts what he is, and there’s a couple episodes where her veterinary skills come in handy, but that’s about it. Mostly she’s still just relegated to the sidelines. In season four when she inadvertently receives Wesen powers, we see Juliette go through the opposite metamorphosis that Adalind does. Whereas Adalind chooses to give up her powers (ironically, in the hopes of saving Juliette), Juliette chooses to keep her evil powers because she’s decided she likes what she’s become. But unlike with Adalind, we’ve never grown attached to Juliette; we’ve never been given a reason to. Adalind has grown so much over the course of the series, whereas Juliette has stayed stagnant. This newfound acclimation to evilness is the first personality-based plot twist that Juliette has undergone. But there’s no foundation for it, and really no reason for a flat-lined character to suddenly decide to embrace the dark side. Except, of course, to again make trouble for Nick. It strikes me as so odd that a show that can create such beautifully complex and strong female characters has had so much trouble crafting the main female character, and utilizing her as nothing more than the main character’s (now ex) girlfriend. Regardless, Juliette is now Wesen, with telekinetic powers and super-human strength. She went from being a throwaway character with no strengths to speak of at all, to having some quite literal ones. I guess it’s a start. At the end of season four, we’re led to believe she’s dead, and pretty much all of the Twitterverse cheered when it happened. But in the last 30 seconds of the season five winter finale, it’s revealed Juliette is still alive, and now wearing a really bad blonde wig. I’m guessing she’s also still evil. Only time will tell if the writers decide to imbue Juliette with more than just the physical strength that came with her evil abilities. I hope so, because I’d really like to see her developed just as clearly and strongly as the other women of Grimm. Trubel is the most recent addition to the show. A teen runaway who grew up bouncing through foster houses, Trubel is wary and street smart. She is also completely unaware that she is a Grimm and what it all means. She’s been running from “monsters” for years, and it is Nick who teaches her who and what she is, just as Aunt Marie did for him just a few years before. Jacqueline Toboni is fantastic as Trubel, perfectly balancing the savviness and fragility of this character. We all know Trubel is strong — it’s clear from the first time she appears, clad in her signature black leather jacket and her face unreadable and stony. She’s independent and able to take care of herself, but we also catch glimpses of the scared little girl she used to be. She’s had no one to explain to her why she sees the things she does or why. This in and of itself reveals her inner strength. Most people would lose their mind seeing monsters all the time, but Trubel has only one thought: survival. As she is further drawn into Nick’s world and begins to care for him and those around him, the conflict inside her is apparent. They are becoming the family she never had, but it scares her and makes her instinct to flee even stronger. After all, the people you care about are the ones most able to hurt you. But Trubel resists the urge to run again and again, and we watch her heart open to those in Nick’s world. It’ll be interesting to see how they develop Trubel in this season. 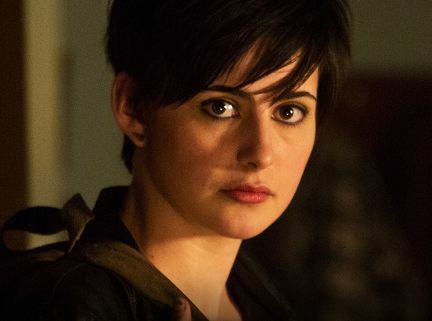 The fourth season ended with Trubel’s kidnapping, and she’s only recently shown up again in the midst of season five. She presumably escaped her kidnappers, but is also clearly harboring a few secrets that haven’t yet been revealed, so I’m excited to see how her character continues to progress. The women of Grimm each have their own set of unique and complex strengths (with the exception of Juliette, perhaps). Some are outwardly and physically strong, while others are a source of intelligence and fortitude. Each of these women embodies strengths and characteristics that are admirable, real, and believable, and it’s because of this that they are foundational to the show. They are why I tune in week after week, and I hope they will give you a reason for tuning in, too (if you don’t already).